Dates are very delicious and sweet fruits on the inside and the outside. They’re like chocolate and caramel snacks that are very hard to resist! In the Middle East, dates are considered the “tree of life” and is the national symbol of Saudi Arabia and Israel. Not only that dates are very rich in history, but also in nutrients. A cup contains about 400 calories, but you can get about 27% of the daily requirement of potassium and 48% of your daily fiber needs. Studies also show that very, very few people are allergic to this fruit. Which means, chances are, you can eat this. Dates are an excellent source of fiber, potassium, and copper. The insoluble and soluble fiber that can be found in dates can have the effect of gastrointestinal cleansing, plus boosting your heart health, and making sure that your bowel and blood movements flow smoothly. This fruit also has anti-inflammatory benefits because of its magnesium content. It can even lower your blood pressure and reduce the risk of stroke. The benefits don’t stop there. 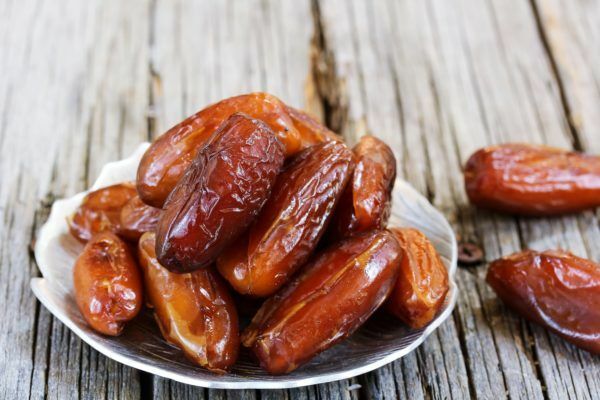 Studies show that dates also help with weight loss, respiratory health, iron-deficiencies, brain performance, arthritis, and even pregnancy deliveries. Amazing, right? Dates are a source of fructose, which is a natural type of sugar that is mostly found in fruits. Since dates have a chocolatey caramel-like taste, they make great substitutes for white sugar. Not only that, but you can also reap the benefits of consuming the nutrients, fiber, and antioxidants of this healthy fruit. All you have to do is make a date paste by mixing dates in water and using a blender. Replace sugar with a 1:1 ratio with date paste. However, since dates are high in fiber, nutrients and high in calories, it needs to be consumed in moderation. 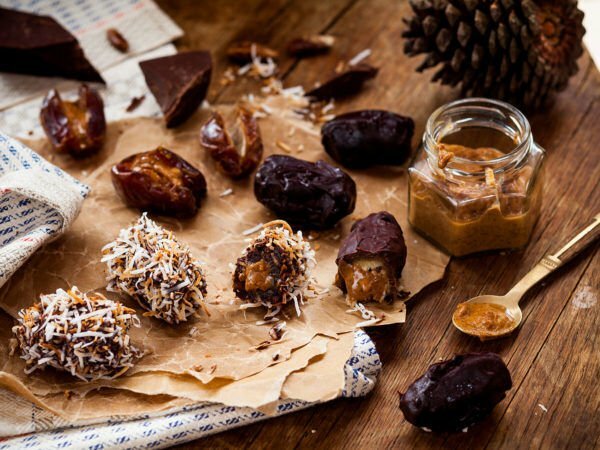 Walnut & Coconut Stuffed Dates – All you have to do is stuff the date with a walnut piece and unsweetened coconut flakes, or roll it in sweetened coconut flakes. Pine Nut & Olives Tapenade – Add the garlic, shallot, parsley, and nutritional yeast to a blender or food processor. Pulse until the parsley is finely chopped. Add the kalamata olives, and pulse just until the olives are broken up into small pieces – you don’t want to puree them. Stir the toasted pine nuts into the olive tapenade. Open each Medjool date and scoop in enough of the tapenade mixture to fill it completely. Pretzel Nugget – Stuff the date with a pretzel nugget and dip the bottom and sides in chocolate. Walnut, Pistachios & Cardamom – Stuff the date with a walnut piece and pack a small pinch of cardamom, finely chopped pistachios, and (optional) edible dried rose petals into the rest of the space. Peanut Butter & Sea Salt – Stuff the date with smooth peanut butter, top with an almond and some crunchy sea salt, and dip the bottom in chocolate. Dates are very versatile and delicious snacks. You can pair them with almost anything, especially nuts and other ingredients. If you love baking, you can use dates as a binder for baked goods too. Add them in cookies and bar recipes. It’s so versatile that you can use it as a sweetener for sauces, salad dressings, and even marinades. It doesn’t stop there either, because you can add them in smoothies and oatmeal. But just like what I always remind all of you, eat everything in moderation. I actually love dates in trail mix. It’s a really nice snack and I even substitute it with my chocolate cravings. Thanks for sharing this. I really love dates as a snack but it can get boring sometimes. I see dates that are pre-packed and have nuts inside already, or sometimes have chocolate coating but it seems unhealthy. There are a lot of recipes for dates but they aren’t vegan because it has goat cheese. I’m just saying that they taste good. Just by thinking of it, it does sound yummy if you try to substitute it to sugar. It has a very rich brown sugar taste to it. Wow, dates are really amazing for such a small fruit. Oh no, Eloise! Don’t do that again. There’s so much you can do with dates and I super love it with cheese and basil. It’s like instant gourmet without much of an effort. I agree, it’s really nice to serve in parties too since it can be quite filling for such a small thing. Peanut butter and sea salt is the perfect dessert for me. Although I try not to eat too much. I was never a fan of dates before because it tasted like a cross between prunes and sweet potatoes? I don’t know, is that just me?! It looks weird! I love chopping dates and baking it along with my granola bars. No other added sweeteners and it’s perfect for snacks when I’m at work. It’s like my bestie before meetings and I know that it’s going to last until after my lunch break. Yeah, I tried it with mozarella and wew. It was heavenly. My granma likes dates in pies and tarts. I think it’s delicious because it tastes a little like caramelized sugar. That sounds delicious, Rose. I bet your grandmother really makes delicious pies and tarts! Dates are so delicious!! I have incorporated them into my diet over the last six months and I have lost 50lbs! Love them. Yes!! The benefits of dates are immense if 3 to 4 dates are taken on an empty stomach other than keeping the digestive system in the order it maintains your BP. Thank you!! This was very informative. This is a tried, trusted fruit that can do a lot to your body. Quite informative and precise. I am going to make it a routine going forward. Dates as part of my diet. Well, guess I’m gonna buy some dates tomorrow and test for myself and see if they really do as you say. Love dates but aren’t they fattening?? I have a major sweet tooth that’ why I love dates! They’re especially good when stuff a pecan in the pitted ones. natures candy! I can eat them and not feel guilty!! I love the ones which are dry from the outside but sugary and yummy from the inside you have to try it with yogurt my favorite snack 7 dates with yogurt. Perfect!! I didn’t know that dates are excellent for our health. They are great source of minerals and vitamins. I think I should include them in my diet. I don’t love dates that much but the ideas that you have suggested seems interesting. I will try them out. I never knew dates had that many benefits, glad I love them. I tried it with milk, it’s freaking delicious and you fell energy flowing through body immediately. It’s great fruit and thanks for explaining the benefits because a lot of people are no aware of what dates even are. I never really like dates but I eat them when I fast. But now I really want to actually try eating them daily. Thank you, Rebecca!! I just love dates, especially at Christmas, when I stuff them with marzipan, half a glace cherry on top and a dusting of icing sugar, yummy!! Sometimes I suffer from high blood pressure and pain in bones. I don’t take them daily, but now I will take daily. I used to ignore dates but after knowing this no chance of ignorance. Thank you Radiantpeach. Usually they shower before I meet them. Ah hah ha ha ha. The fruits? The thought never crossed my mind to wash them. I just eat them like a normal person. I adore the taste of dates! Dates are ideal natural sugar carriers with no harm when consumed in right quantity. Great info. Can I use date paste in tea instead of sugar? If so will there be any bits left or will it melt into the hot water like honey does? I’m thinking about using it instead of sugar or honey for Kombucha brewing and Ginger Beer. I have seen people use Date Syrup but that’s too processed, almost like Caramel. Have tried Date Sugar but that doesn’t melt. Will this work? Dates are excellent for our health. Great source of minerals and vitamins. We should include them in our diet. Oh they look and sound delicious! But are they good for a snack while on a diet ? I use to believe dates were good for u but then found out they have sulfur added to them which many people have very bad reactions to BEWARE! 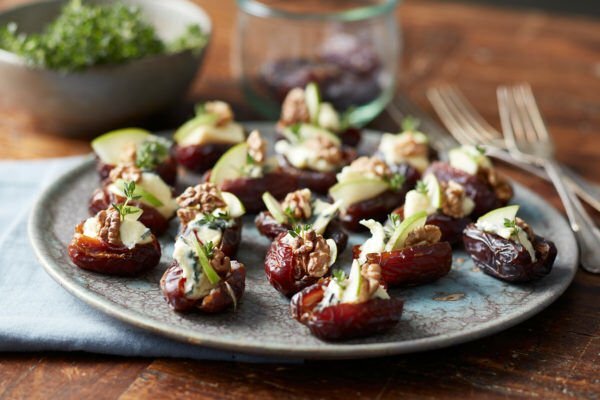 Medjool dates with stone removed, add a teaspoon of vegan cream cheese and half a walnut in the centre of a date, result delicious….. I left refined sugars food and beverages and started to eat dates when i’m craving for sweets. I eat 30 dates a day. I feel my memory is sharper and yes my vision is improved during the night. Thanks for the excellent information. I like dates and now I will eat as you suggested. I mix dates and prunes and put in my blend tec and chop them up and then i put in boiling water til it get the consistency of jam…. Thank you this was wonderful I bought a box of dates the smaller ones I’m not sure of the name of them. Been eating and I’ve noticed it’s really helped me a lot my energy and I feel so much better. I love dates so much! Those and honey are sweetest natural and very very healthy desserts. They were eaten in Biblical times too. For some reason I always think of that even though I’m not religious. OMG!!! I love dates! They’re sooo good. Even my kids love them. Thanks for sharing . These look so good and simple to make! (so many yummy recipes nowadays are too complex) Can’t wait to try them! They are yummy, have been just enjoying dates without knowing the actual benefits of them. There’s a reason this came up on my feed, time to start eating dates… thanks for the info . Oh my goodness these look sooooo good! I’m heading out to get plenty of medjool dates and make a start! Thanks! I love dates! Stuffed or not, they’re perfect snacks along with raisins. A few dates daily early morning before breakfast is very good, but do not peel them cuz the skin have benefit too. My favorite recipe for dates is chopping it and adding it to my oatmeal. I find that it makes me feel full real quick in the morning and I don’t have to eat snacks before lunch. I have stopped eating cake or other sweets. I take 5-6 dates in a day when I feel craving for sweet. These look so delicious, cute, and healthy!! It’s my first month as a vegetarian, soon transitioning into a vegan lifestyle and these are perfect for my sweet tooth!! Thank you! Thanks for good info. But I have noticed I am having stomach acid trouble. So is it better for me not to have it on empty stomach? Dates are small and sweet fruits and have a surprisingly low glycemic index. Studies have been done to determine the effects of consuming dates on blood sugar levels. Great information. I love dates and will start eating a few dates a day. Too bad they are so expensive. I love them. When I eat them I do not crave candy at all. I’m magnesium deficient so this is a perfect nutritional food for me. Mixed with some plain whey I bet this could be a beast of a post or pre-workout shake! I love dates so much probably my fave! I grow up eating fresh dates. Dates come in hundreds of types. And for thousands of years desert folk in the Middle East relied on them as the mean sources of nutrition. Everybody should try them before a workout and you’ll have twice the energy. And if you like coffee in the mornings have 3 dates with your coffee the flavors and taste are really good and amazing it will surprise you. I know, it tastes the same and is probably a healthier alternative too. Dates are so delicious! I’ve incorporated them into my diet over the last 6 months and I’ve lost 50 lbs! Love them! This is so wonderful finding out! Thank you for making this article. There are facts I haven’t ever known before. I’ve googled this and haven’t had any luck finding a resource so I thought I’d ask. Are Dates safe to consume in small amounts or are they too sweet for me to maintain ketosis? This would be perfect in salads especially for people who have a sweet tooth. Just don’t go crazy with eating it since it packs a lot of calories. Walnuts are my favorite nuts because the taste isn’t too bland. However, before I put it inside the dates, I soak it with raspberry vignairette. Dates actually have a good amount of fiber in them I learned today! I bought dates and actually used them for the first time today to find out that my dates have 30g carbs/3g fiber per serving, which is pretty good! Dates are very healthy…. I was told by my doctor that the sugar in dates is not a problem. Love them! 😋 The only reason to worry about dates is if you’re trying to lose weight. I don’t really eat dates but do see some plant based desert recipes have dates in them. Do you think it’s too much sugar? I don’t eat them by themselves because they are too sweet for my palate. I like dried apricots and figs. Bananas are another go to fruit to satisfy my sweet tooth. I used to have homemade date rolls every day for breakfast. I loaded them up with chia and flax and nutritional yeast, sometimes a few different nuts or dried fruits. But, now I’m doing keto/paleo so that is WAY to much carbs for me. Do miss them though! Dates are basically sugar. Probably more natural than some other sources of sugar, but sugar nonetheless. Dates are a very energy dense fruit along with other dried fruits. I try to only eat them occasionally as a treat and focus on whole fruits especially berries. Where does one find dates in a grocery store? I don’t think I’ve ever seen them. Produce? Near the nuts? Raisins? I eat dates during my long runs on marathon training. Somehow the minerals and amount of sugar is just perfect for me, better than taking energy gels. I find it super easy to snack away on dates without keeping track of how many i’m eating. Because of this, I rarely buy them. When I do have them, I make sure to consciously limit my intake in one sitting. One of my favorite ways to eat them is to stuff an almond or walnut into the center and wrap in prosciutto. Best. Snack. Ever. They are absolutely incredible in oatmeal. I have also noticed that if I eat a bowl of oatmeal with a few dates in it before workouts I don’t get jittery at all and I’m not starved after. I eat them. but as occasional treat, not even a snack. just grab 6 to 8 raw almonds per date. and blend them. then roll it in to little balls and store them. I prefer the medjool variety…they are huge! If you have a health food grocery store nearby..Sprouts, Whole Foods, etc, that is one place to have more choices. Middle Eastern grocery stores are also ideal. Trader Joe’s has them, too. I have a special relationship with dates. I farmed them for a few months–I kept thinking I would get sick of them, but I never did. I like figs, and prunes more. Dates kind of taste like pure sugar to me. But yeah, this is way better than those artificial snacks.